Recommended meditation guide book for seekers and meditators. Meditation Guidebooks vol 1, 2 & 3 by Piya Tan. 1. 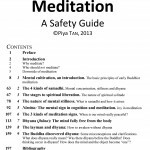 Meditation 1: a Safety Guide by Piya Tan, 2013. [ISBN: 978-981-07-8585-7, size A4, 220 pp.] A recommended handbook for meditators and seekers. Introduction. Why meditate? Who should not meditate? Downside of meditation. (1) What is meditation? Personal development and mental cultivation. (2) The 4 kinds of samadhi. Mental concentration, stillness and dhyana. (3) The stages to spiritual liberation. The nature of spiritual solitude. (4) The nature of mental stillness. What is samadhi and how it arises. (5) Nimitta: The mental sign in cognition and meditation. Joy in meditation. (6) The 3 kinds of meditation signs. When is our mind really peaceful? (7) Dhyana (jhana): The mind when it is fully free from the body. (8) The layman and dhyana: How to awaken without dhyana. (9) The Buddha discovered dhyana: Some misconceptions and clarifications. What does dhyana really mean? Was there dhyana before the Buddha? Does thinking occur in dhyana? How does the mind and the object become “one”? 2. Meditation 2: a Skills Guide (click for details) by Piya Tan, 2014. [ISBN: 978-981-09-0617-7, size A4, 176 pp] A recommended handbook for meditators and seekers. (1) The 5 mental hindrances. The 5 barriers to mental focus and habits that weaken wisdom; how to break through them. (2) Negative desire. How the senses work and how they can work for us. (3) Lust and how to overcome it. (4) Ill will and negative emotions hinder personal progress: how to overcome them. (5) Karaniya Metta Sutta (Khp 9 = Sn 1.8). How to cultivate unconditional love. (6) Sloth and torpor. Mustering effort and energy in our minds. (7) (Thina,middha) Tissa Sutta (S 22.84). Drowsiness can be overcome by insight. (8) Restlessness and remorse: Not letting our past control us; keeping the future where it is. (9) Doubt: Why we lack confidence and how to build it up. (10) Nivana Pahana Vagga (A 1.2.1-10). The 5 mental hindrances: their causes and ending. (11) Vitakka Santhana Sutta (M 20). How to overcome distractions during meditation. 3. Meditation 3: a Stillness Guide by Piya Tan, 2014. 1 Patisallana Sutta (It 45). The benefits of a balanced practice. 2 Dhajagga Sutta (S 11.3). The recollections of the 3 jewels. 3 Buddhanussati. Recollection on the 9 virtues of the Buddha. 4 (Sanditthika Dhamma) Brahmaṇa Sutta (A 3.53). The nature of the Dharma. 5 Dhammânussati (Vism 7.68-88). Recollection on the 6 virtues of the true teachings of the Buddha. 6 Sanghanussati. Recollection on the 9 virtues of the noble community. 7 Silanussati (Vism 7.101-106). Recollection of moral virtue. 8 Caganussati (Vism 7.107-114). Recollection of charity. 9 Devatanussati (Vism 7.115-118). Recollection of deities. Meditating on one’s own godliness. 10 Pacala Sutta (A 7.58). Eight ways of overcoming drowsiness and the nature of discipleship. 11 Vimutt’āyatana Sutta (A 5.26). Can liberation be won without meditation? In Singapore: S$20.00 (self-collection); $25.00 (by post). Outside Singapore (incl Malaysia & Brunei): $43.00 (by airmail). Outside Singapore (except Malaysia & Brunei): S$28.00 (by surface mail). 3. By cash. Please drop in at “The Minding Centre“ on Wednesday evenings. For other date/time, please email: themindingcentre@gmail.com or call +65 8211 0879 (speak to Ratna). For equiries, please email themindingcentre@gmail.com, or call / text / whatsapp +65 82110879. We aspire to learn, teach and practise mere Dharma, or “non-religious Buddh­ism,” that is, Buddhism as simple as possible, as the Buddha Dharma, so that it is open to all who seek true stillness and liberating wisdom. Mere Buddhism is easy: live it and be free.